"If you're the horsey type, try Christopher Cerf and Paige Peterson's inspiring work Blackie: The Horse Who Stood Still. 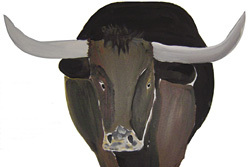 If you loved Ferdinand the Bull, then your kids will love Blackie as seen by Cerf and Peterson." 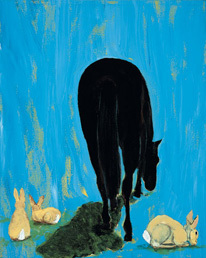 beautiful new book, Blackie, about a real horse who liked to do...nothing." "If this one doesn't bring out the Kleenex box, I don't know what will. Not because it is sad (anyone who has had to remove a sobbing 5-year-old from a screening of Bambi learns to be cautious about children's books where dogs, horses, or mothers die), but simply because this true story is very touching." Winnarainbow Kids Camp Director, Woodstock Master of Ceremonies, Seva Board Member, Ben & Jerry's ex ice cream flavor, Hippy Icon Flower Geezer and Temple of Accumulated Error. "Paige Peterson's work continues and even updates a Pop-minimalist tradition that includes such practitioners as Will Barnet and Alex Katz. 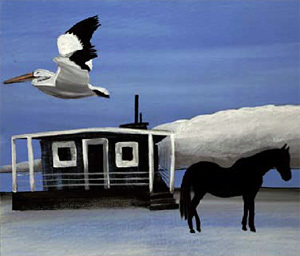 Her particular use of negative space, however, is personal and distinctive. It seems both to conceal and project a certain emotional content and even hint at an underlying narrative." "Reading Blackie to their children is reason enough for couples of all sexes to consider adoption." "A story about a horse who likes to stand still is endearing. That the tale could bring hundreds of children to their feet in applause is extraordinary. When they finished reading their new children's book, Blackie: The Horse Who Stood Still, to 300 elementary school students in California, Christopher Cerf and Paige Peterson received a standing ovation...The book also touches on death, a topic not often explored in children's literature. 'We really didn't set out to do it but when we read in schools, kids asked so many questions about that, 'how did he die and will he be remembered?'' said Cerf. 'He had a really model death in some sense, [and] he had a great life and he will be remembered forever for doing what he did.'" "Standing still never made so much sense.The journey of a thousand miles ends with one horse who demanded to stand still. I'll give it a try tomorrow, but I've to run today. Oh, right, I missed the point. Stillness is an art cleverly celebrated by Chris and Paige in this charming tale of determination and tenacity. A lesson for all." "I wish our daughter still nestled in my lap so I could read her the inspiring story of Blackie, a horse who appeared lazy but in fact understood why nature is to be savored and change is sometimes to be resisted. I think I'll read it to her anyway!" "This extraordinary collaboration between two brilliant artists--one with pictures and one with words--is a pleasure to read on many levels. It's a beautiful book about a horse, but it's also a thrilling story about the value of stillness and the wisdom of animals. In our hurly burly world it's a wonderful thing to take a moment to absorb Paige Petersen's beautiful paintings and the sly sage teachings of this wonderful story. We should all stand still sometimes, and this book shows us how--it should be required reading for children and adults." "What a stunning sense of composition! I love these paintings!" "In the tradition of Ferdinand The Bull, Blackie is a sweetly unorthodox beast. There is a swell message here, but burrowed in as it is amongst the gorgeous illustrations and snappy text, the lesson merely catches a ride on Blackie’s myriad other charms. My family LOVES this book." 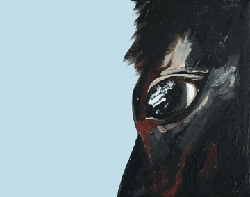 "Blackie is a story of a horse who spent his last years in Tiburon. My sons are now in their 50s, and I remember driving by Blackie almost daily with my sons, and there were many times we stopped, got out of the car, and just stood with him in his presence. Throughout Blackie's life he stood still. What seemed like a disadvantage continually turned to advantage. He listened, he watched, he dreamed, he was safe for children and adults alike. By example, he taught peacefulness and suggested that life's answers were not necessarily found in activity. Blackie The Horse Who Stood Still teaches us that giving and receiving occur at the same time, and the more we give, the more we reinforce the reality of Loves presence in our lives. This is a book to be read over and over again." "As an elementary school student over forty years ago, I read a poem at Blackie’s memorial. Life has brought an array of experiences since that time—I have studied many traditions, became a psychologist, written books, and raised a family. And yet, as I pause to consider what to write for this wonderful book, I realize that I needed to go no further than Blackie’s Pasture by the bay to find the most important formula for a meaningful life: Slow down, be still, know what is most important, find joy and beauty in the moment. Thank you Blackie!" "An enchanting story -- its radiant, bemused wit emerges into wisdom. The drawings are exquisite; it really is a wonderful book." 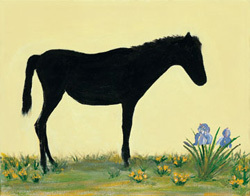 "BLACKIE is an equine delight...the story and the illustrations are witty, deceptively simple, and simply beautiful." "This is not just a book for kids, although they should read it or have it read to them by anyone who cares about sprawl, overcrowding, the environment, quality of life, sense of place and conviction. The team of Chris Cerf and Paige Peterson has created an optimistic handbook on how to live with change but more importantly how to guide it. It's a personal, beautiful book with quirky paintings and charming text about a goofy horse who has more in common with Gandhi than Trigger. It's about one special place but applicable to many. It’s about doing the right thing. What a concept! Buy it, give it, read it, keep it and read it again. Pass it on." "Both the poetry and illustrations make this beautiful book a favorite of my grandsons and other children I have read it to here in Saudi Arabia. The story of this stubborn horse, told with such spark, makes it clear to children that you can be different from everyone else and still contribute and be loved for what you are." "Charming. Beguiling. Magical. Touching. And, astonishingly, also true. The tale of Blackie, and the loving and lovely illustrations, make this a classic." "Written in joyful and irresistible rhyme, and presented in gorgeous and vivid llustrations, Blackie is the captivating story of a horse who teaches children and adults alike the lessons of endurance, of adherence to one's principles, and of the steadfastness of love. Together Paige Peterson and Chris Cerf have created a magical, whimsical, and triumphant real-life fable--a tour de force of the heart." "The paintings are filled with such true joy and spirit... and, while Blackie's tale touched me like Shel Silverstein's The Giving Tree, it embodies an even more profound statement about what should be of ultimate importance in our lives: contentment." "Oh, how I love this book. And the illustrations make me almost weepy. I can't wait to buy it for my granddaughter, Lily, and read it to her for years. Blackie will be for Lily what Misty of Chincoteague was for me (except Misty wasn't funny and wacky like Blackie.)" "Fabulously inventive and beautifully illustrated! The writing evokes children's story classics of the Dr. Seuss genre. 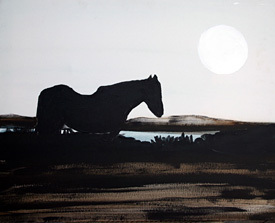 Blackie the Horse Who Stood Still draws from the powerful tradition of real life tales that are fanciful but true. In a world that hardly ever stands still, the story appeals to young people's need to learn important lessons like patience and consistency. And despite its traditional roots, the lilt and texture of the language and illustrations are refreshingly modern!" "Paige Peterson's art is filled with the magic of light, the colors of love, and the joy of being alive." "Like the proverbial leaf in its fall foliage and its metaphorical mate in the desert that encounters a gust of wind, I was "blown away...." What a gift Paige Peterson and Christopher Cerf have to be able to express the mind and spirit of a child's world. They captured what had to have been the essence of Blackie's soul and sense of dignity alongside curiosity regarding the homo sapiens who passed his way." "I’ve always been fascinated by the appeal, to children of both sexes, of captivating movies and books ostensibly about horses but really about life. Blackie advances the art in text, illustration and empathy for its title character. Even though my 'kids' are grown, I have a perfect new gift for my friend’s kids." "I just LOVE LOVE LOVE 'Blackie'! I think it's great that it's a true story. It's quite touching. Paige Peterson's illustrations are really wonderful–they have a naif quality that draws you in (like Rousseau), and they are very witty as well–how she places things or leaves things out. The text is so well done. So many of the rhymes (and rhythms) are wonderfully playful and just super–I particularly liked the 'Salinas/Between us' rhyme–but there are many more that I loved. And the lines 'When you get tired of trying, I'll still be standing still' are really superb!" 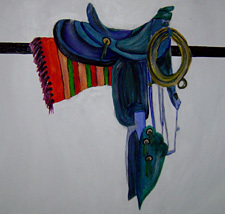 "The book is very sweet, a nice twist on the cowboy world. One would never expect a passive equestrian partner. The writing is good and the images are wonderful. I love the many styles and viewpoints. 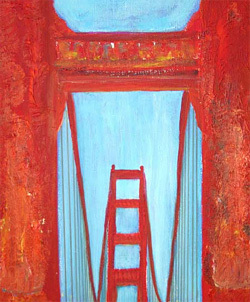 There is a primitive freshness and spontaneity to the paintings. The whole thing is really charming. I think it will find a broad audience. And it deserves to." "Blackie is indeed an inspiration to those young and old. The lessons Blackie teaches are perhaps the most important yet quite overlooked: the true sense of self." "Over the years, as I’d looked at Paige Peterson's work, I was amazed. Her styles changed – radically. The only common thread was excellence. Chris Cerf and Paige Peterson collaborated on a whimsical, mostly true, rhyming story about a horse that wouldn’t play the game." "Peterson and Cerf hit a home run with BlackieThe Horse Who Stood Still. Cerf's talent with words and Ms. Peterson's wonderful paintings make this gem of a book a must for all ages. Bravo to this talented team." "As someone who has the every day privilege of witnessing the magical and powerful relationship between children and horses, I am impressed with how this book captures that spirit and translates it into word and picture. Beautifully written and drawn...think The Velveteen Rabbit meets Ferdinand the Bull." "Both the story and the illustrations are enchanting. This book is a special gift to anyone who reads it. In this hectic world, through Blackie, Christopher Cerf and Paige Peterson have shown us the value of love, compassion, quietude and the strength in being oneself." Actor, "A Prairie Home Companion"